I’VE BEEN taken out of my comfort zone more in the past few weeks than I have in the past few decades, and all of it occurred on the other side of the equator. In late January and early February, I was part of a small group of French and Australians, including NSWALC CEO Geoff Scott and Councillor Anne Dennis, touring slums and villages throughout the Philippines. The study tour was organized by GK Australia, the local arm of Gawad Kalinga (GK), a Filipino aide organization famous for helping ‘the poorest of the poor’. The trip provided more than a few epiphanies, and much of it was confronting, which I’ll get to. But for me at least, one of the most challenging parts of the trip was more personal than professional. I am, of course, referring to South East Asia’s love of karaoke. If I was meant to be a singer, then I presume I would have been born with a singer’s voice. I was not, hence why I’m a writer. And so it was that on our last night together, our GK hosts rolled out a karaoke machine. Mindful of the Australians in the room, they also put on a few slabs of beer. Obviously, it made things a little easier – the boundaries of comfort zones tend to blur the more you drink. After talking my way through The Gambler, then Puff the Magic Dragon, I finally hit my straps with six bottles of San Miguel beer and ‘Do Re Mi’ from the Sound of Music. The simplicity of the opening line has always annoyed me a bit: ‘Let’s start at the very beginning, a very good place to start’. But it’s a very handy segue into a column about lifting Aboriginal people out of the mire poverty. From the outset, I should note that while poverty in the Philippines is extremely confronting, it’s not any more so than anything you’ll see in hundreds of discrete Aboriginal communities – and some not so discrete – around Australia. But what’s different about Philippines’ poverty is the sheer scale of it. In Australia, about one quarter of the Aboriginal Australian population lives in remote communities, where much (but not all) of the worst poverty endures. We’re talking about less than 150,000 people nationally. But in the Philippines, you can travel just a few kilometres and pass three times that number. 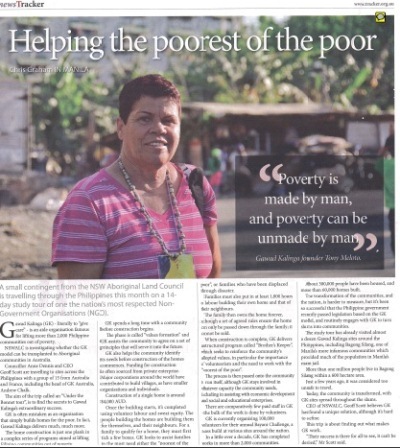 In a nation fast approaching 100 million people, around 40 percent live below the poverty line. 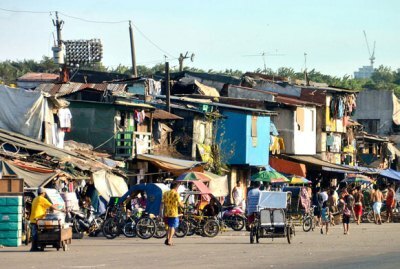 Bagong Silang, a slum on the outskirts of Manila, is home to more than a million people, crammed into a 600-hectare space. To give you some perspective, that’s the same size as the Sydney CBD, which is home to around 22,000 residents, and, during weekdays, a place of work for 235,000 more, the vast majority of whom reside in high-rises. There are no skyscrapers in Bagong Silang – just one and two storey structures that look like they’d fall over if the Big Bad Wolf breathed on them, let alone blew. The point being, the problem of poverty in the Philippines is very, very big. Filipinos have no social safety net. If you don’t work, you don’t eat. So the incentive to get out there and bust your arse is a strong one. On that front, I’ve never seen a stronger work ethic. Tens of millions work more than 12 hours a day, seven days a week. Their income is around $50 a month. Which leads me to my first Filipino epiphany. Australia’s social security system is clearly one of the greatest barriers to Aboriginal advancement. Getting something for nothing – passive welfare, in the words of Noel Pearson – is a major challenge. Of course, pretty much everyone working in Aboriginal affairs today knows that, although I acknowledge it was Pearson who fought hardest to entrench the view. Even so, having identified the problem, we all want to know what the solution is. 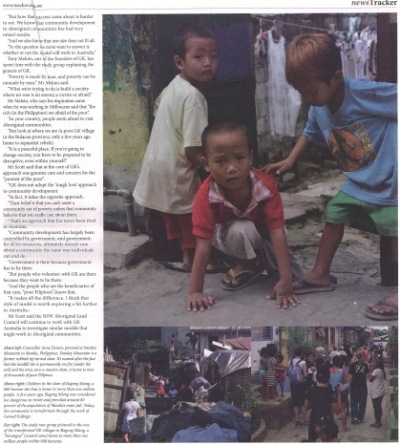 In the Philippines, Gawad Kalinga has found it. They’ve assisted more than 2,000 communities, built around 60,000 homes and housed around 300,000 people. And they’ve done it in less than a decade. Most of the work has been done through private fundraising, which has delivered substantial savings to the Filipino taxpayer. Each home was constructed at a cost of less than $4,000 AUD, and took just a few weeks to construct. Granted, they’re not palaces – the average GK home is just 20 square metres, not much bigger than a prison cell. But compared to the corrugated iron shanties that litter the cities and towns, a GK house is luxury on a grand scale. Contrast that to Australia, where the Howard, Rudd and Gillard governments have invested their faith – and our tax dollars – in the Northern Territory intervention. In the first two years of the intervention, Australian Governments managed to blow around $150 million of the housing budget on consultants, without constructing a single home. By the end of the intervention, Australian taxpayers will have shelled out almost $1 billion for housing. For their investment, they’ll have received less than 1,000 new homes, and many of those will be uninhabitable within a few years thanks to population growth outstripping housing provision, entrenched over-crowding, and poor maintenance. And like Gawad Kalinga, it will have taken us around a decade to achieve this, rehousing less than 10,000 people in the process. Clearly, we’ve got it very, very wrong in Australia. 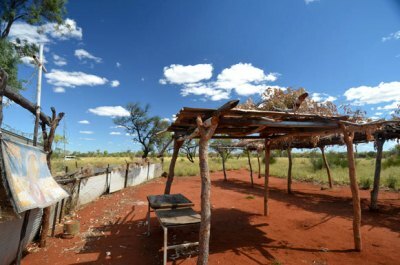 A typical scene from Central Australia. This is at Camel Camp in the Utopia region. We have lined the pockets of large construction firms to the tune of hundreds and hundreds of millions of dollars, with little return on our investment and bugger-all in the way of skills transfer to Aboriginal people living in the communities. And therein lies another epiphany. One of Gawad Kalinga’s core principles is sweat equity. You want a new home? Then you help build it. And you help build the homes of your neighbours as well. The second part of the strategy – helping your neighbor – is a brilliant variation on the sweat equity theme, because apart from the obvious benefit of building an appreciation for your own home, it also builds an appreciation for your neighbour. As the head of GK Australia, Andrew Chalk, recently remarked to me, it’s a lot harder to fight with your neighbor when you helped build his house, and he helped build yours. But sweat equity, while a crucial part of the process, is just one strand of an extremely complex program with very simple goals. 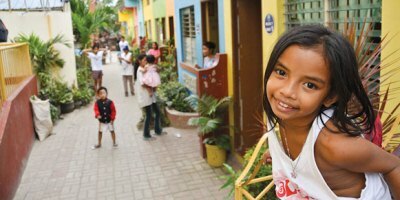 Construction in a community doesn’t begin until Gawad Kalinga until it has worked with the community in a process called “values formation”. That can involve months, often several years, of intensive consultation with the community to establish a set of principles on which not only the homes will be built, but on which the community will be run. When construction is complete, GK continues to work with the community on educational, economic and social programs. It is a genuine partnership in ever sense of the word. And it is the precise opposite of what we do in Australia. Which leads me to yet another epiphany – on the political front, we all have a few bitter pills to swallow. For the Left – my mob – there must be a genuine acceptance of the toxicity of passive welfare. It’s one thing for us to concede that ‘sit-down money’ is a problem for Aboriginal people. But it’s another thing altogether for us to really understand the strength of its poison, and to actively campaign for ways to change it. Simply giving someone something for nothing – ie. a house – might seem like a basic human right, but it’s also a fast-track to apathy and community dysfunction. While I will never accept that there is some other alternative to a social safety net, I do now understand that we need to find a better ways to deploy it. I’m not suggesting Aboriginal people not be given access to adequate housing. I’m suggesting that we find ways for Aboriginal communities to help build them, and ways for Aboriginal people to take control of them, whether that be ownership or some other form of permanent tenure. So that was my lesson for the Left. The lessons for the Conservatives, I imagine, will be just as confronting. Gawad Kalinga’s philosophy is based on Love. The capital ‘L’ is intentional. And note the exclusion of the word ‘tough’ in front of it. Love-ins, hand holding, caring, values formation, people sitting in circles and discussing their feelings are all concepts that freak Conservatives out. I felt the same way about karaoke. But tough love – the safety net of Pearsons and politicians everywhere – does not work, has not worked, and will not work. 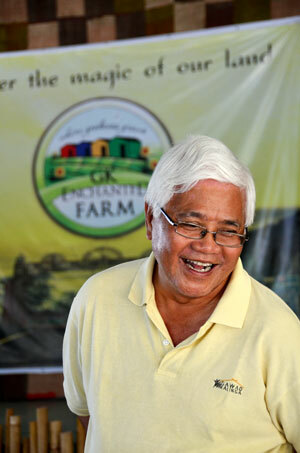 The reason why the Gawad Kalinga model has worked – and the reason why the men and women behind it are amongst the most revered people in Philippines society – is because of the effort they put into building genuine relationships in the communities BEFORE they bring in a single bag of cement. That’s the precisely the thinking that needs to sweep Aboriginal affairs in Australia. But it cannot be led by government. And that was my other great lesson from the trip. Aboriginal people must lead the process. It’s a view I’ve long articulated, but like my acceptance of the problem of passive welfare, I don’t think I really understood how important it was. Call it whatever you want – self-determination, self-management, sovereignty. It doesn’t matter. What is important is that we understand that government is the biggest part of the problem, and Aboriginal people are the biggest part of the solution. Government believes that it is doing things FOR Aboriginal people. But since federation, government has been doing things TO Aboriginal, almost always without informed consent. Some of the motivations in more recent times may have been good, but the outcomes have been disastrous. We can apportion blame for that however we like, but what we can’t do is deny that it’s occurred. And we can’t expect that it will change if we keep doing what we’ve always done. We can start the process of change by remembering that you can’t expect big government to care about little communities. Government is about the masses. It’s about affecting the greatest positive change across the largest possible area. Inevitably, that leaves some big cracks through which to fall. Bureaucrats and their contractors build communities because they’re paid to. But volunteers – whether they’re locals or blow-ins – do it because they want to, and because they care. Aboriginal people must take control of their communities and their destinies. They must lead the process. And that means cutting ties with government as much as humanly possible, at least for now. It doesn’t mean refusing to go to the local government-funded health centre. But it does mean looking elsewhere to create preventative health programs, so eventually you don’t have to go to the health centre. It doesn’t mean refusing to send your kids to a government-funded school. But it does mean finding other ways to educate your kids that serve the Aboriginal community, not the NAPLAN bureaucracy. And it doesn’t mean signing a treaty with government, or a memorandum of understanding, or some funding agreement that entrenches white aspirations for black Australians. Treaties are important. So are MOUs. And so is funding. But they can only ever be beneficial in the longer-term when Aboriginal Australians have negotiated them from a position of genuine equality. That position, at its core, is dignity. And that is my greatest epiphany from the trip. Yes, GK build houses. Yes, GK build communities. But what they’re fundamentally seeking to do is restore a sense of dignity and self-worth to a people mired in poverty. Like the song says, that’s a very good place to start. Note: Another article about the GK Australia Study Tour (also by Chris Graham) was published in the Australian magazine Tracker. Chris Graham is a Walkley Award and Human Rights Award winning journalist, the former managing editor of Tracker magazine, and the former founder and editor of the National Indigenous Times. He’s now a freelance writer based in Sydney. Click here to visit his blog.